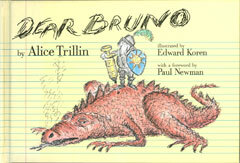 In 1979, Alice Trillin, who three years earlier had been diagnosed with a malignant lung tumor, received a call from good friend Annie Navasky telling her that Annie’s twelve-year-old son, Bruno, also had cancer. Alice’s response was a letter to Bruno in which she tried to show that it was possible to talk about cancer in a tone that was frank, honest, and funny. Children and adults struggling with the ‘why me?’ of cancer will find in this book a realistic, funny, and somehow, reassuring exploration of the fight for survival. Illustrated with cartoons by New Yorker artist Edward Koren.